What beautiful paintwork! However did you get that mottled effect? 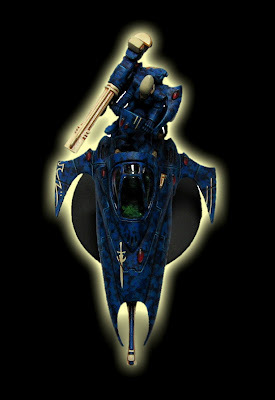 Awesome looking (even if it is heretic alien scum). Ha, great paint job and i'm liking the photoshop efforts. I really like the contrast between the gunners helmet and the general color of the vyper. Awesome model, I like the paint work especially. 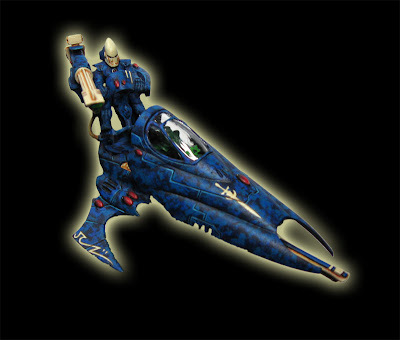 It's similar if not better than one of the armies I have seen in the 40k rulebook. Haven't got it with me for reference, but great work mate! I love the color combination and definately looks better than the ones in codex. Terrific job! Can you let us in to your secret of how to get that mottled look? Hi guys, thanks for the nice words :) The mottled effect is very simple to achieve: I painted the model first dark blue, then I used a middle-dark blue to paint spots all over the dark blue, leaving some areas unpainted; then I used a middle blue and painted spots again; then I came back to the dark blue and did the same; and went around this a couple of times more until I was satisfied with the result. The spots were painted hitting randomly the model with the tip (just the tip) of an old and soft brush that still was a bit sharp, having the paint diluted but consistent. It’s a rather careless painting technique, but I like the results very much. To finish the blue I painted (washed) very dark blue in the recesses of the armor platings and painted a few carefully placed highlights with bright blue in thin strokes. That’s all; it took me no more than four hours (gunner included).